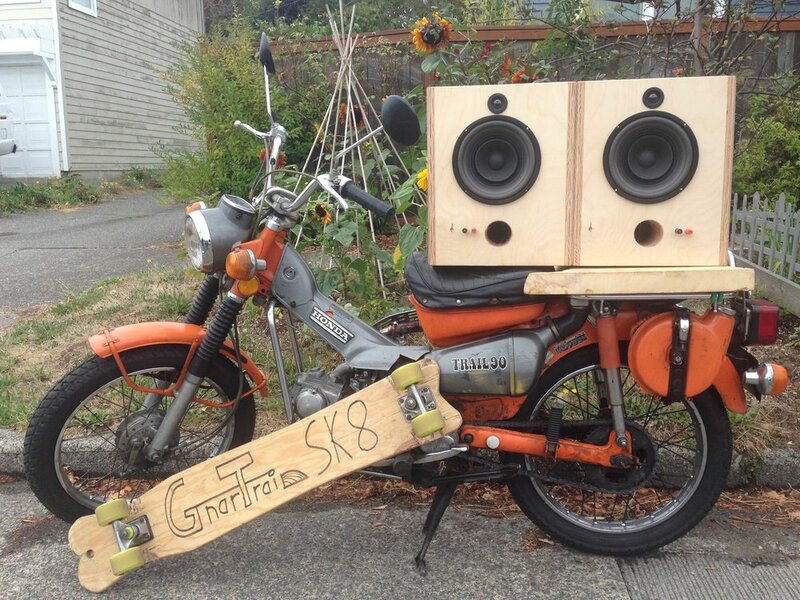 Handmade audio for people who make time for music. 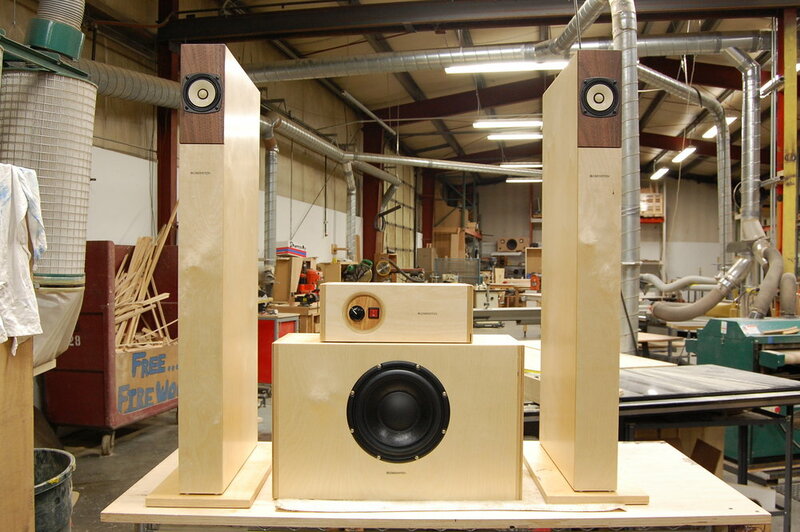 Clark Blumenstein's interest in speaker design and manufacturing first took root as a fascination with the physics and cultural relevance of the variety of loudspeakers produced throughout history. This fascination germinated alongside the pursuit of a music history bachelor's degree at Whitman College in Walla Walla, WA. During the course of earning his music diploma, Clark was an apprentice for three years at the world-famous high-end speaker company Cain & Cain Audio. There he studied under master cabinet maker Terry Cain. After Terry's untimely passing from lou Gherrigs disease, he studied under Terry's apprentice. After they chose to leave the business, he studied under Terry's widow, landscape artist Leslie Williams Cain. (Clark also services certain Cain & Cain Audio products by custom request (maintenance, upgrades, and repairs)). Blumenstein Ultra Fi initially started out of a small home-based workshop as Clark's top secret experimental laboratory for new Cain & Cain designs with a primary focus on the research and development of small high-fidelity single driver speakers. The initial results were good. With Terry's approval, Clark began shipping them to a small, but growing number of enthusiastic clients around the globe. After building the business for a few years in Walla Walla, WA, Clark took a summer-long apprenticeship with Feastrex in Nirasaki, Japan. He studied under and ultimately assisted master driver makers Teramoto-San and Akiyama-san. Clark absorbed the intricate hand-making processes of fullrange drivers using handmade washi paper, exotic Alnico, Field Coil, and Permendur Field Coil magnetic circuits. Clark resettled in Walla Walla making speaker cabinets for Fostex, Feastrex, and Pioneer Full Range drivers and subwoofers. He first focused on iteratively refining compact wide-band full range single drivers supported by either a subwoofer or a super tweeter. In short, he built many, many experimental and short run custom and commercial boxes! His quest eventually became to miniaturize the extreme performance possible with larger and more expensive designs from Cain & Cain Audio and Feastrex into more affordable, accessible realms in terms of overall product design and value engineering, even though the speakers would still be entirely hand made. Of the many speaker models made during this time, the Orca became the favorite of the Blumenstein community of clientele. Making the ideal passive subwoofer system to support the Orca fullrange speakers was the main challenge overcame in research and development during this time. Additionally, the design requirements of minimizing enclosure size and maximizing durability, non-toxicity, and sustainability came into full focus during this period. These qualities are crucial for ensuring the speakers could be enjoyed in ever more more practical (non-ideal) room placements while retaining superior overall accuracy in sound. During this period, there were also minor tweaks to enhance the maintainability and upgradability of this era moving forward of Blumenstein Audio designs. Clark then migrated to Seattle where, taking inspiration from the capacious waters of Puget Sound, he expanded production capacity and gradually expended the lineup of offerings. In November 2015 he launched three more main production Blumenstein speaker models - Marlin, Triton and Benthic speakers, augmented by Waterline Cables and Blumenstein accessories. 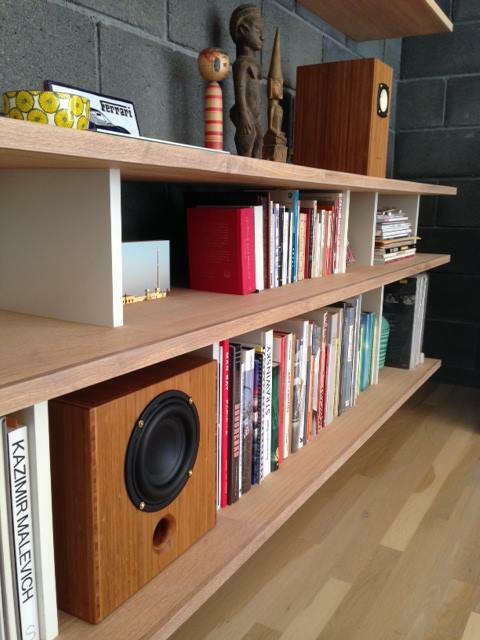 These commercially and acoustically successful designs now ship out by the batch monthly. All Blumenstein products, cables and accessories are still built by hand in house, by Clark Blumenstein. Summer of 2018: expanded the business into a new workshop in the historic Wallingford neighborhood of Seattle. I am now faceting the trademark solid Douglas Fir braces and am also oiling the interiors of each cabinet in addition to the sweeping changes made back in 2016. Also, bracing orientation has changed in order to provide greater rigidity and therefore greater resolution, especially so with the new, thinner wood options for most popular models. Limited edition Orca special released in 2018, and front ported bass reflex cabinets are now the default option for all full range models in 2018. Rear ported cabinets are still available via special request. To mark roughly 10 years in the business, I began shipping an entirely upgraded sound system design platform for model year 2016. People who have been following the Blumenstein brand for a while know that I am a very careful product designer who does not make the flavor of the month. All dimensions have subtly changed to fit the updated cabinet design formula. 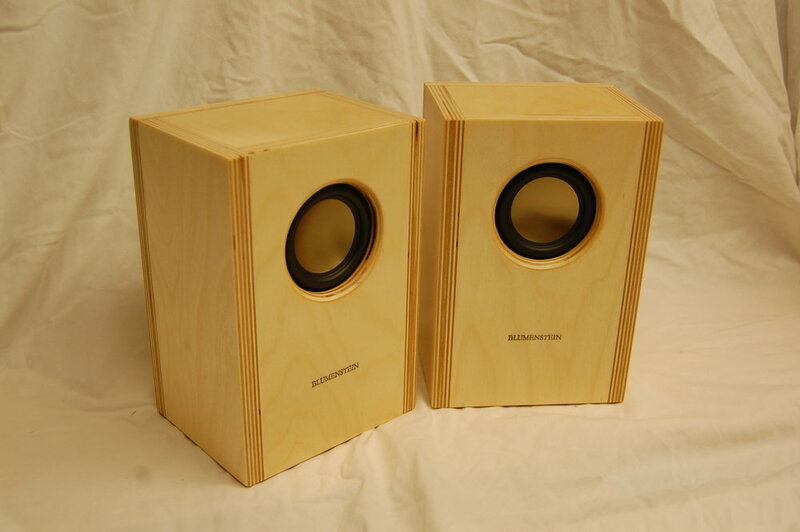 Also, all plywood used in the re-tuned speaker and subwoofer enclosures has new thicker plywood options. The internal bracing has been correspondingly redesigned to be even stronger and is now shaped to be better sounding in terms of internal reflections within the cabinet. The new sound quality is even more delicately yet powerfully voiced, balanced in timbre, with near-infinite depth in the midrange and substantially more and better bass energy that is now fully synergistic and driving for the music. Most recognizably, these new models are marked by the new "BLUMENSTEIN" brand on the front of the speaker, which is now from a new wood burning iron - a significant upgrade over the prior use of a rubber stamp and heat lamp. The sonic improvements that the new products have been given are due to numerous upgrades given to the tools used on the production line, higher end parts used inside the speakers, and tighter methods of assembly that were recently developed. Most notably I have upgraded the saws, soldering tools, soldering techniques, and solder. For the speaker internals, a number of upgrades were given - especially the fact that I am now using new high performance minimalist damping materials that are now made in-house (time consuming to make, and tiny, but effective!). In my woodwork and joinery, there is a new, curved profile given to the updated arrangement of locally sourced, in-house milled Douglas Fir internal braces that serve as the skeleton of all enclosure designs now - giving an even greater strength to weight ratio, and a mixture of curved surfaces, spaces, and angles - which is the ideal environment for shaping the standing waves inside the cabinets to give a new, more cohesive, clearer and deeper voice to Blumenstein sound systems. New, larger, vibration absorbing feet inspired from high end skateboard wheels are now used on the bottom of all cabinets and heavy components. 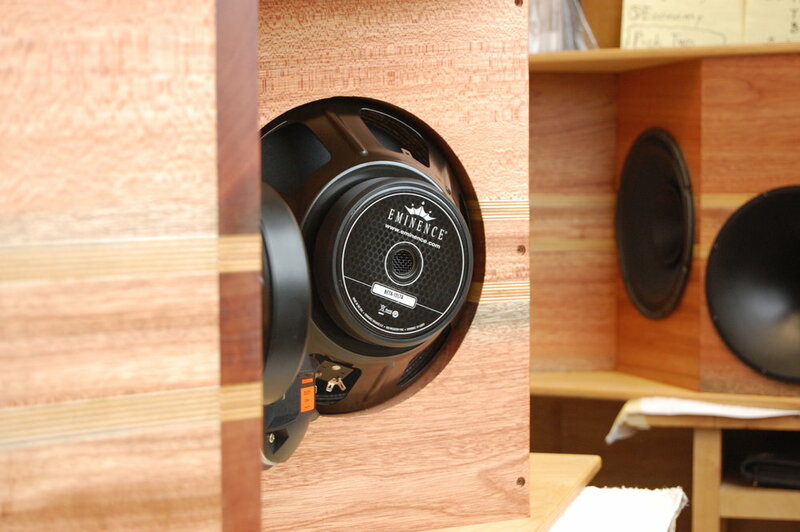 New custom sourced sturdy black mounting hardware is used to mount all speaker drivers. Finally, improved sandpaper and finish product applicators top off the list of major upgrades to regular production items. The Blumenstein Benthic Bass Unit, is an especially improved model - as I am now using close to ideal golden ratio enclosure proportions - in order to voice the standing waves in the small, but important amount of lower midrange that the subwoofer cabinet still makes through the crossover. The Benthic Bass Unit is an acoustically pure passive subwoofer design - without any unneeded internal chambers - powered by a significantly upgraded, Neodymium magnet subwoofer driver and a New Modular Outboard Subwoofer amplifier. Yes, we realize that the New Benthic Bass Unit driver looks 100% identical to the Ferrite magnet driver we used in prior Dungeness subwoofer model but I assure you that the new driver does in fact have a new Neodymium magnet and sounds like a different speaker - much larger, significantly more powerful, yet even more detailed, subtle, and chameleon-like than the Dungeness or Orca Sub that I made prior to 2016. The ultra high quality Hammock Line RCA-> Minijack cable was finally added to the lineup in December. This exciting new product is a wired remote control for your audio system from your favorite device. While it is a great looking shade of bamboo, the higher temperatures it takes to "cook" a sheet of natural bamboo all the way to the chocolate color makes the fibers within the sheets too brittle for my extremely tear-out-sensitive joinery method, which made orders take longer to fill because I was having to make too many attempts to get perfect joinery for just the chocolate bamboo orders. The currently still active material offerings of Natural, Caramelized, or Two-Tone Bamboo Ply, or Birch Plywood Orcas (now, just called "Orcas") are made in 3/4" wall thickness and are able to be joined and then polished flawlessly day in, day out in the workshop with no/extremely little tear out. I use top quality USA made saw blades and premium architectural grade bamboo and birch plywoods. The Orca "Classic", made of 1/2" bamboo and birch, were the most established design with over eight years of refinement, and are the original groundbreaking music makers that put my company on the map. In early 2015, I decided that the designs needed to move forward and that I would replace the 1/2" Orca Classics permanently with the 3/4" Caramelized, Natural, or Birch Orcas. If you already own 1/2" Orca Classics and wish to trade up to 3/4" Orca cabinets, then just get in touch with me. 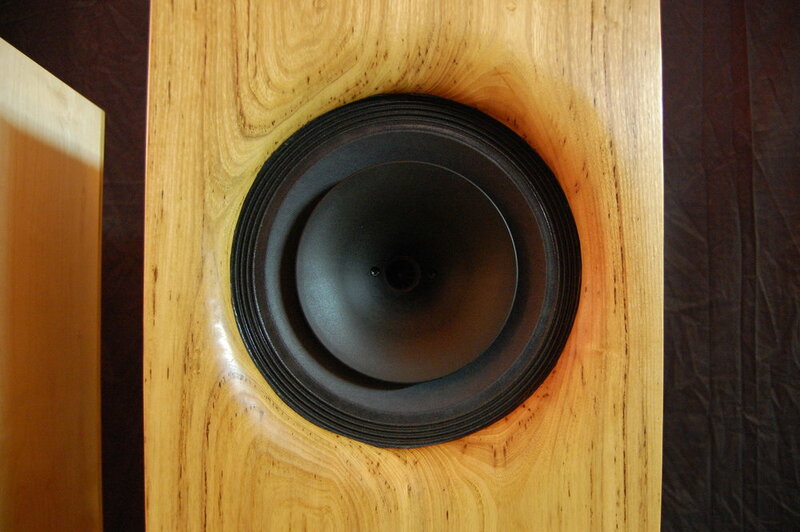 Designed as semi-compact loudspeakers for medium to extreme power handling from a 5" single driver, the Makos were the ultimate offering until the Douglas Fir cabinet bracing technology I invented for the Orca Mini (now Marlin) design was put into the Orca and eventually Triton enclosures. The sound improvements were disproportionally slanted to the Triton, Orca, and Marlin models and the Mako/Mola models were barely improved. Additionally, I realized that the large, heavy cabinets were too unwieldy for us to make by hand with my joinery method. The newer, smaller, modular sound system and cabinet design platform (Nov. 2015), has now superseded the sound quality of all the previous Mako offerings. The new, smaller cabinets can more effectively be mechanically isolated from neighboring components and each other with the new vibration absorbing cabinet feet. If you currently own Mako speakers and wish to accessorize your system, then please refer to the current offerings for subwoofers, and cables. The new Seamount Speaker stands and Plinths can be custom sized for the larger mako Fullrange or Floorstander cabinets. If you are interested, just get in touch! The Dungeness Classic, Deluxe, and Max were a series of active subwoofers with 25 watt amplifiers that I produced between 2013 and 2015. My customers have enjoyed these amazing, compact high efficiency subwoofers, but over time I was asked to make an "ultimate" sound quality, even more compact, more powerful option, which is where the Benthic Bass Unit design has come in. Everything I have learned from the Dungeness filtered into the new Benthic Bass Unit subwoofer design. The Orca Sub was a passive subwoofer unit shaped to slip comfortably amongst furniture and sound great. I liked many things about the Orca Sub, but ultimately, I moved on to the more compact shape of the Dungeness. The passive Orca sub too, has fed into the design of the new, passive Benthic Bass Unit, which far surpasses the performance of either the earlier passive Orca Sub or active Dungeness Models. **Please note that I provide excellent upgrades and support for any of historic subwoofer models in regards to upgraded subwoofer amplifiers and also the Depth of Field Kit for historic Blumenstein active or passive subwoofers - which is a deal at only $59 per cabinet. ** With the complete suite of Depth of Field upgrades installed to convert your subwoofer to a passive subwoofer, hooked up with all new Waterline Cables (speaker cable and anchor chain or RCA) and of course, paired with one of the new external Outboard subwoofer amplifiers, any older model Blumenstein subwoofer can be brought up to the 95%+ of the levels of performance you can get with of the new subwoofers. All images, text, designs, Copyright 2006 -. All rights reserved. Web Design by Calleigh Little.